Welcome to Part 2 of How to Shave Your Neck with Minimal Discomfort! Today we will be focusing on tricks to get the smoothest, closest shave possible while minimizing irritation in this extremely sensitive area. Try them out, let us know which tricks work for you, and tell us what your own techniques are for conquering the neck shave! Also, remember to check out Part 1 here. You’ll notice a big difference between shaving your neck immediately upon application of shaving cream/soap vs. shaving your neck last, after the lubricant has had a chance to absorb into follicles and soften them. 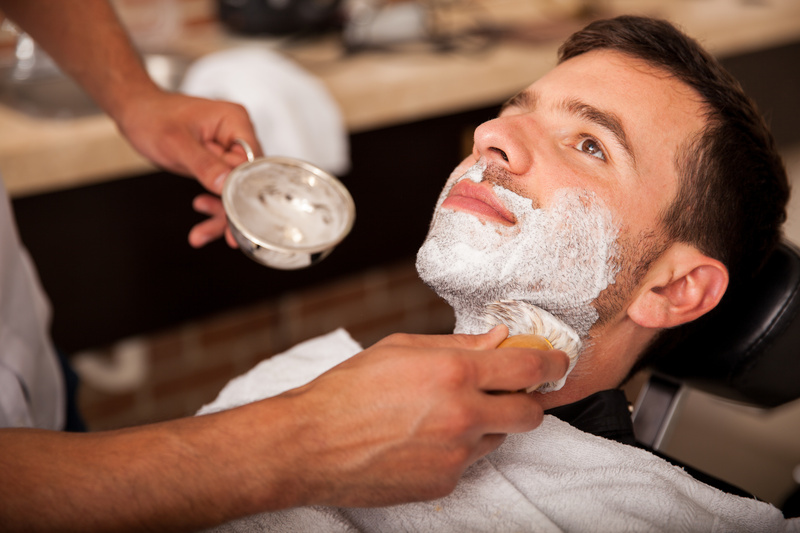 Once moisturized, your facial hair should be easier to cut (and you should experience less irritation). Lean forward and tilt your head back slightly to stretch out the skin on your neck. To cover the areas right underneath your jaw, tilt your head down and flatten your jawline. The skin on your neck is thinner and more sensitive than the skin on your face, so resist the urge to press down hard to shear more hair. Instead, opt for short strokes and a shallow angle. Shave across the grain – don’t go against the grain in such a sensitive area – and do a second pass across the grain if stubble is still showing. It’s normal to have leftover stubble after the second pass – but for your skin’s sake, we suggest you make peace with that tiny amount of shadow and avoid a third pass. Rinse your neck with warm water, then cool water. Follow with aftershave/toner. Toner cleans up all the remaining gunk on your face – extra lather, dead skin – while disinfecting so you don’t end up with clogged pores and razor bumps. Choose from toner or witch hazel to sanitize your skin post-shave – you can also try an aftershave like Prospector Co. KC Atwood Aftershave Splash, which has witch hazel built right in. Seal the deal with an aftershave balm like Brickell Instant Relief After Shave to soothe skin and create an emollient barrier between you and the elements. When the weather is extra dry and chilly, we also suggest layering a moisturizer on top to prevent scaliness (Triumph & Disaster Gameface Moisturizer Tube is a customer favorite).